Taking inventions to innovation has the potential to revolutionize industries, improve standards of living and create jobs in local economies. So how can individuals explore the worth of patented research to bring innovations to market? Let’s look at a group of student researchers at UCF who decided to patent their innovative discovery – a hydrophobic and self-cleaning nanostructure material. The team, Feynman Nano, believed that sheets of these nanostructures could be applied to solar panels to both reduce the cleaning time and increase panel efficiency. To determine if they had a viable business, the researchers participated in a program that teaches individuals how to validate their proposed market, UCF I-Corps. 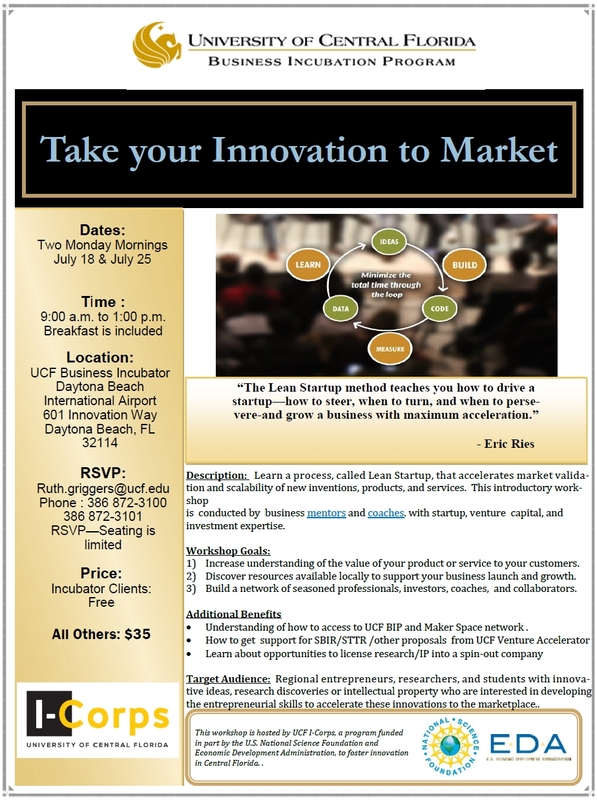 UCF I-Corps is funded by the National Science Foundation (NSF) to teach the process of starting a business through the Business Model Canvas (BMC). The BMC gets rid of the traditional business plan and focuses on conducting a series of hypothesis tests to validate assumptions before building a prototype or starting a business. 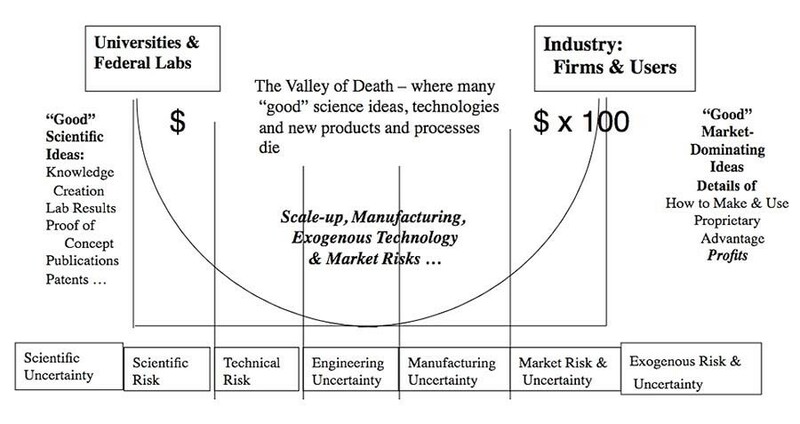 In turn, this reduces the risk of falling into the “valley of death,” where 90% of startups fail. A survey of failed startups conducted by Forbes determined that “42% of them identified the ‘lack of a market need for their product’ as the single biggest reason for their failure.” Learning the BMC methodology has empowered Feynman Nano to survive the valley of death through understanding what they were building and for whom, before they built it. During the 5 week I-Corps program at UCF, the team conducted over forty face-to-face interviews to gather data and validate their assumptions on their customer segment (the group that would eventually purchase their product) and value proposition (reason for purchasing the product). After receiving feedback from potential industry customers and the I-Corps teaching team & mentors they learned that although their customers wanted the technology, they did not want to pay for them to scale. Feynman Nano then researched residential solar uses for a self-cleaning application, but found the market wasn’t sophisticated enough to know it need their product. To better understand where the technology could be scaled, they explored different options by “pivoting” their focus to various possible applications. Since UCF I-Corps provides seed money from the NSF, they were able to attend industry-specific conferences to meet potential customers and continue their search. After several rounds of pivoting, the team settled on an anti-microbial application for preventing healthcare associated infections. As a result of going through the UCF I-Corps program, Feynman Nano now has NSF lineage (which means they can apply for exclusive NSF grants) and a 60% increased chance of obtaining SBIR/STTR funding. Since their graduation, they have applied to the National I-Corps program, where, if accepted, they will receive $50,000 in seed funding. Feynman Nano was also accepted in to one of the most prestigious accelerators in the world with a 2% acceptance rate, Y-Combinator. Countless stories like this can be found and are waiting to be discovered. Between 2012 and 2014, UCF spent more than $433 million dollars in research expenditures and has hundreds of patents waiting to be tested in the market. 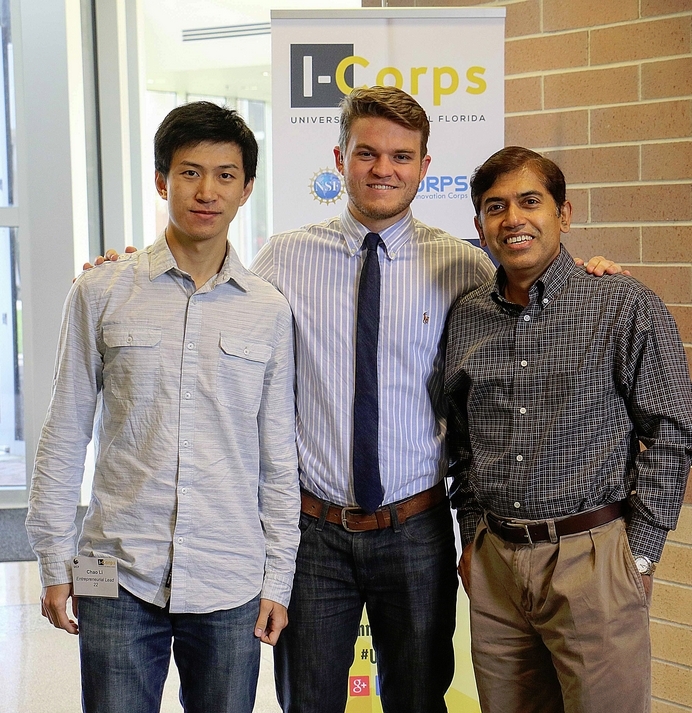 UCF I-Corps has been proven to increase a startup’s probability of success and reduce the probability of failure. So if you either own a patented technology or are looking to license a patent to create a company, why not increase your chances of success by going through UCF I-Corps? For more information about the I-Corps program, contact Vanessa Zabala. https://icorps.cie.ucf.edu/wp-content/uploads/2016/06/image06179131710.jpg 331 818 UCF I-Corps /wp-content/uploads/2013/04/logo-cropped.jpg UCF I-Corps2016-06-27 13:14:282016-06-27 13:18:08What Happens to the Research? Distinguished as one of the first cohorts in UCF’s inaugural I-Corps program, Talon Simulations has successfully transitioned from the Lean LaunchPad program to commercialization. Led by graduate student Brandon Naids, Talon has been recognized for its Atomic A3 Full Motion Simulator, which is for sale to customers worldwide. Talon recently entered into an agreement with U.K.-based Atomic Motion Systems, which is handling product development and manufacturing. Talon’s Atomic A3 Full Motion Simulator is available as a racing/flight system, hands-on throttle and stick jet system and passenger/ride system. All simulators are packaged with Simphynity motion extraction software with over 100 supported games and Oculus Rift virtual reality headset support. Through their I-Corps participation, Naids and his Talon team worked to develop an in-flight training simulator that bridged the gap between expensive, bulky modules and those that are cheaper, static and of lower quality. Their focus was to develop an immersive, affordable and effective flight training simulator. The simulator has received accolades from flight instructors as well as commercial and military pilots during initial demonstrations. Thanks to its use of flight simulation software, precision motion control and a 360-degree head-tracking virtual reality display, Talon’s simulator provides a reduction in the motion sickness that can occur from this type of simulation training. To learn more, visit TalonSimulations.com. (ORLANDO, Fla) – Nine teams were chosen by the University of Central Florida (UCF) I-Corps selection panel, as part of its activities that support the Florida Innovation Network, to move research discoveries out of university labs and into the marketplace. Created by the National Science Foundation (NSF), the Innovation (I-Corps) is an important economic development initiative that identifies university researchers, and provides them mentoring and startup funding, to connect research into emerging products and services that benefit societal needs. The third class (cohort) represents a cross section of students from various UCF programs ranging from entertainment media, nanoscience, virtual simulation, communications, political science, as well as modeling and simulation. 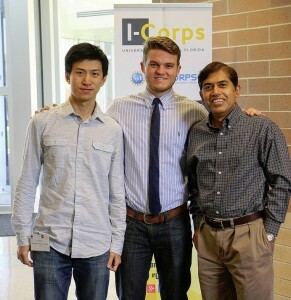 I-Corps Selection Panel selects cohort 3 teams. Panel consists of (from left to right): Tom O’Neal, Phil Dumas, George Gramatikas, Oscar Rodriguez, Ben Patz, Michael O’Donnell and Ivan Garibay. UTA SiM – developing a simulation-based tool that allows for fast, easy and automated construction of simulation models from a spreadsheet. Wear Lab – developing a vibro-tactile belt that facilitates safe, efficient, urban navigation for visually impaired and complements existing technologies. Bygshift – developing an app to bridge information gap faced by transfer students. Safety Simulations – developing a 3 dimensional virtual simulation for safety that can be used by any industry for safety training. Diversity & Intercultural Communication Training – developing a simulation based intercultural and diversity training. AR Enhanced Playing Cards – developing a procedural/process based training tool available on demand. Capacitech – utilizing nanoscale materials to design and develop coaxial cable incorporated with supercapacitors. Wind Swarm – developing a reliable, low to no maintenance, durable anemometer system with no moving parts. iMyth – developing an interactive program, theme-world engine, to provide an enhanced entertainment and immersive experience to customers. 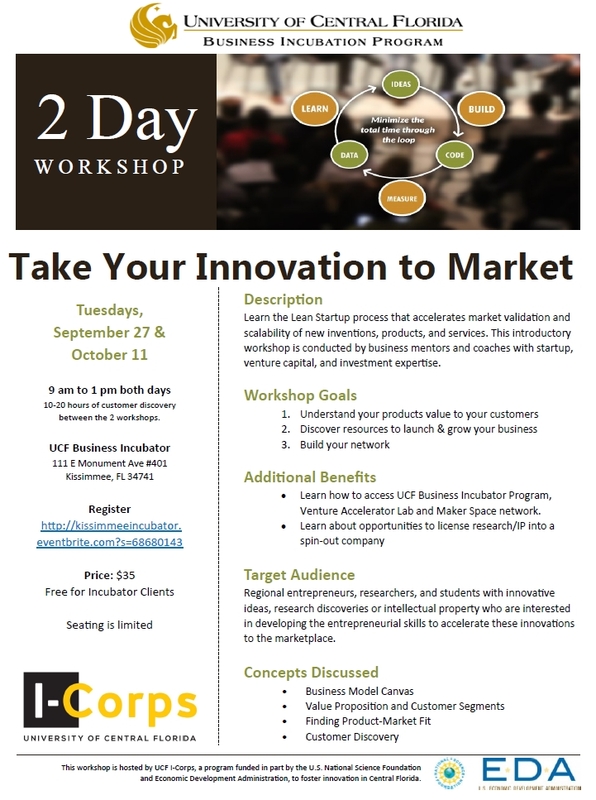 The UCF I-Corps program provides aspiring entrepreneurs with an immersive, hands-on program designed to teach them how to test their ideas, gauge feasibility, understand consumer demand, examine competition and develop mutually beneficial partnerships to help transition their ideas into profitable enterprises. Experienced advisors and mentors oversee the teams and coach them toward success. “We thought we were brilliant and knew everything we needed to know to succeed, but the I-Corps program made us realize that we didn’t know enough. Throughout the weeks we learned a lot of valuable lessons, as our instructors provided us with the keys to discover our potential and go on to start and grow a successful company,” says David Nash of Smartphone Spectrometer (cohort 1). For more information about UCF I-Corps, please contact us. U.S. Sen. Bill Nelson and Secretary of Commerce Penny Pritzker announce funding two initiatives that will advance innovation and capacity-building activities in regions across the country. Gaining momentum for its continued leadership in innovation and commercialization, UCF was awarded two federal grants totaling up to $750,000 from the U.S. Economic Development Administration’s (EDA) Office of Innovation and Entrepreneurship (OIE). The College of Engineering and Computer Science (CECS) and community partners raised an additional $750,000 in matching funds to supplement the EDA grants. These partners include: Harris Corporation, City of Orlando, Crossroads Investors, Canvs, Rollins College College, Starter Studio, Creative Village Orlando and others. This represents $1.5 million to help foster the culture of innovation throughout the central Florida region. U.S. Secretary Penny Pritzker came to UCF during a press conference to make the exciting announcement last week, as part of the 2014 Regional Innovation Strategies (RIS) program grants. UCF was one of 24 institutions to receive RIS program funding, which is a new initiative designed to advance innovation and capacity-building activities in regions across the country, and one of only two universities to earn both an i6 Challenge Grant and a Cluster Grant for Seed Capital Funds. The i6 Challenge was launched in 2010 as part of the Startup America Initiative and is now in its fourth iteration. i6 is a national competition that makes small, targeted, high-impact investments to support startup creation, innovation, and commercialization. Now that the i6 Challenge is included in the new Regional Innovation Strategies Program, the funding will support more than just Proof-of-Concept Centers. Investments will also go toward the expansion of existing centers and in later-stage Commercialization Centers, which help innovators fine tune and scale their innovations to bring new products and services to the market. The total amount of funding for the i6 Challenge under RIS is nearly $8 million. The i6 Challenge funds will be used to extend the UCF I-Corps pilot program across the five economically challenged central Florida counties (Orange, Seminole, Osceola, Brevard and Volusia), and to help transition the region’s engineering workforce into high growth technology companies that design, manufacture, and export innovative products through the Maker Spaces Proof Of Concept Center (POCC). This Center will also leverage both the statewide Florida Cleantech Accelerator Network (FL-CAN, which was created through a former i6 grant) and the Osceola County Advanced Materials Research Center once it is opened. StarterCorps Fund The Starter Corps Fund will directly address the critical gap in seed funding that is the largest barrier faced by the region’s technology entrepreneurs. The same five counties referenced above will be directly served by the StarterCorps Seed Fund. UCF will set up the StarterCorps fund structure, in the first six months, raise a minimum of $1,000,000, which is enough to fund 12 companies through the first year. Ultimately it will raise, deploy, and manage a $5 million evergreen StarterCorps Seed Fund to launch innovative technology and advanced manufacturing startups based in central Florida. investments. StarterCorps will provide equity-based funding in a series of milestone-based investments. Milestones will be based on a team’s aggressive progress in transforming commercially viable prototypes (which were developed in Starter Studio and I-Corps programs) into viable technology companies that gain early market traction, have a complete founding team (business and technical skills), secure IP, and can prove they are addressing an urgent market opportunity. “The StarterCorps Seed Fund addresses the funding gap by developing stronger teams prepared for Angel investment, said Michael O’Donnell, founder of the Florida Angel Nexus CEO and executive director of the UCF Center for Innovation and Entrepreneurship (CIE). “We want to ensure that all entrepreneurs have access to the tools they need to move their ideas and inventions from idea to market. The Regional Innovation Strategies Program competition is designed to advance this mission across the United States, strengthening our economy and our global competitiveness,” said Secretary Pritzker. UCF I-Corps helps teams of innovators go through all the necessary steps before taking an item to market and uses the UCF College of Engineering and Computer Science’s new Maker SpaceLab Complex, created with generous industry partners to help them through idea, design and prototyping. Thomas O’Neal, director of UCF’s CIE estimates that in the fifth year of the program 195 companies will be created producing 1,730 new high-wage jobs through these teams. “The UCF Engineering Maker Spaces have already proven their value for our students in developing prototypes and testing ideas. These grants will enable us to provide this value to more students and to the community,” said Michael Georgiopoulos, Dean of UCF’s CECS. “We are working with regional community partners and industry to make Central Florida an epicenter for innovation, technology, and entrepreneurship. These grants will enhance our ability to help more future entrepreneurs across five counties. The awards are a validation and recognition of the Central Florida ecosystem and UCF’s role as the partnership university,” said O’Neal. More information about the Regional Innovation Strategies Program, including a full list of the 2014 grant recipients, can be found by clicking this link. A newsletter showcasing news, highlights and partners involved in the innovation and entrepreneurial ecosystem at the University of Central Florida.